Despite having more No. 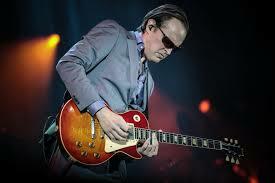 1 blues albums than anyone in history (20) and logging over 200 shows a year, Joe Bonamassa remains a relative unknown. The fact that blues players are primarily featured in guitar and trade magazines full of technical jargon and equipment features make them less accessible to popular culture and readers of mainstream music magazines like Rolling Stone, of which Bonamassa has been openly critical. Nonetheless, his brilliant under the radar career has been defined by a tireless work ethic and the simple passion for making music in the most puritanical sense. He delivered another one of his trademark two-hour, high energy blues rock gems halfway through his 2019 U.S. tour. Channeling Muddy Waters, he opened in his usual suit and shades on his signature sunburst Les Paul with “Tiger In Your Tank.” With torrid drum work from Anton Fig (David Letterman band), they set the stage for a bruising blues cruise featuring songs mostly from his latest No. 1 “Redemption” with a tip of the cap to blues greats ranging from Albert King to Willie Dixon. The band features Rock and Roll Hall of Famer Reese Wynans (from SRV’s Double Trouble) on keys and Nashville based bassist Michael Rhodes who has contributed to the careers of The Dixie Chicks, Reba McEntire and Faith Hill. Bonamassa’s workhorse is an arsenal of Les Pauls, but the Strat made an early appearance only four songs in when he tested seemingly every fret with blistering runs on “Just ‘Cos You Can Don’t Mean You Should.” You don’t have to be a blues aficionado to appreciate a good solo and each of the 14 songs featured at least one. Midway he said, “You can see we have an extra amp up here. I want to bring out one of my favorite players.” Out came Austin, Tx. based David Grissom. He knows a thing or two about the blues having worked with The Allman Brothers and John Mayall. 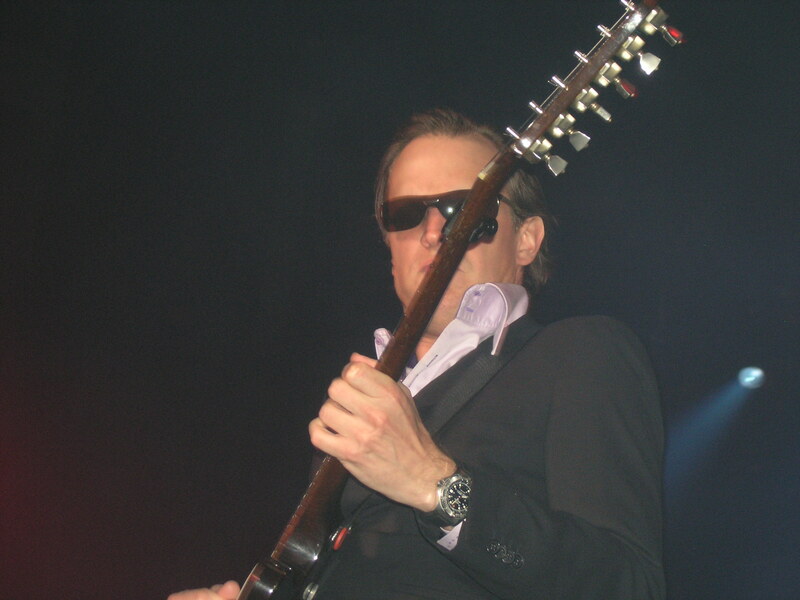 They traded blazing riffs on the cover of Albert King’s “Breaking Up Somebody’s Home.” Though Bonamassa doesn’t have a signature sound, he has proven he can rock hard with his recently resurrected side project, Black Country Communion. You can tell when he channeled Jimmy Page on the Led Zeppelin cover of “How Many More Times” to close out the set. He returned with a blazing acoustic shred on “Woke Up Dreaming.” If they handed out a setlist to patrons before the show, it is a distinct possibility, save for his devoted followers, that a significant portion of the audience wouldn’t recognize any of the songs. It is also a distinct possibility that those people left the theater as new fans. He is billed as “one of the greatest living guitar players.” It would not be unjust to take the word “living” out of the tagline and it would still ring true.